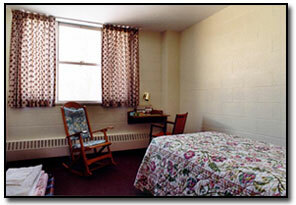 Welcome to the home page for the Saint Camillus Retreat in Attleboro, Massachusetts. This retreat is open to men and women recovering from a compulsive gambling addiction through a 12 Step program. The retreat is held at the LaSalette Center for Christian Living - in a modern and comfortable retreat house situated on spacious, well-landscaped grounds. The Center also offers a spiritual book/gift shop, devotional candle lighting, healing stairs, and wooded trails that are great for prayerful walks, meditation and exercise. The rooms are single with a sink and mirror, and each two are joined by a bathroom with a shower. 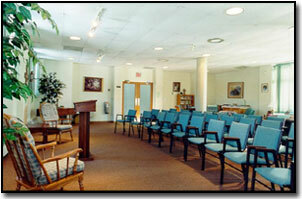 The retreat house has a large dining room, comfortable meeting rooms, prayer room, and beautiful chapel. The annual retreat is an excellent opportunity to enrich your recovery and deepen your spirituality. You can attend any or all of the topic meetings throughout the weekend, enjoy fellowship, make new friends, as well as spend peaceful time in quiet thought and meditation. The serene and spiritual atmosphere serves as a wonderful preparation for the holiday season. The cost of the retreat this year is $215 per person. This includes your room for the weekend, the Friday night pizza party, three meals on Saturday, an ice cream social Saturday night, and breakfast on Sunday. There will also be coffee, tea, and snacks available throughout the weekend. Weather permitting, there will be a golf outing before the retreat Friday the 18th. Please contact George S for details. (978) 658-2761.